Each model comes in a special presentation box and includes a serial number card. Limited production of 500 models. Celebrating 50 years of the Boeing 747 "Queen of the Skies"
Shown to the public for the first time on September 30th 1968, was the first Boeing 747 "Jumbo Jet", City of Everett N7470 construction number 20235 ir was rolled out at Boeing's Everett Field Washington and identified internally as RA001. The 747-400 series was the first version of the Boeing 747 to be built. It was operated by a flight crew of three and was designed to carry 366 to 452 passengers, It is 231 feet, 10.2 inches (70.668 meters) long, with a wingspan of 195 feet, 8 inches (59.639 meters) and overall height of 63 feet, 5 inches (19.329 meters). 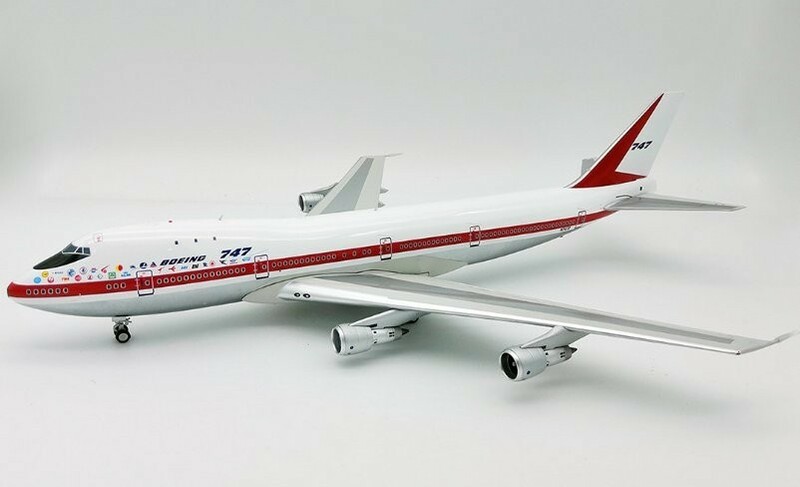 N7470 made its first flight on February 9 1969. It last flew in 1995. City of Everett is on static display at the Museum of Flight ad Boeing Field, in Seattle Washington.